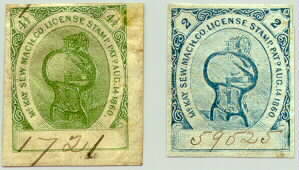 Between 1860 and 1890, in the USA, License and Royalty stamps were affixed to various products to show that the manufacturer had been given permission by owners of the patent involved to use such a feature in his product, and the stamps usually indicated that a certain fee had been paid for the privilege. In this respect they are very similar in purpose to Mechanical Copyright royalty stamps. 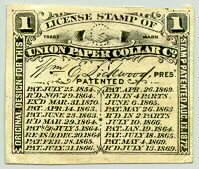 UNION PAPER COLLAR CO, 1c, 1869? 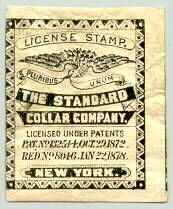 STANDARD COLLAR CO, no value, 1878? The best listing of these is Springer's Handbook of North American Cinderella Stamps, 1973.